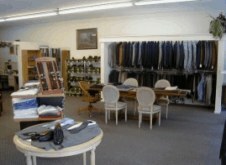 Alex's Fashion and Custom Tailoring has been serving San Clemente and South Orange County with "old world" tailoring skill since 1985. Our master tailors have extensive experience working with all types of clothing. We have used this knowledge to search the world marketplace to bring you the best selection of tailored clothing and slacks, as well as shirts and ties. We carry high quality, lightweight suits appropriate for the sunny Southern California climate, and the finest Egyptian cotton shirts by Lipson. We specialize in custom designed/tailored wedding, bride/bridesmaid dresses & gowns. We know it's a big day for brides, so you receive personalized attention by experienced tailors. You'll enjoy good prices and the best service - even on short notice (no problem!). We provide affordable tuxedo rentals, including slim-fit and modern-fit by Formal Knight, and custom alteration - perfect for high-school/prom/winter formal dresses and suits. Any clothing item purchased/brought in the morning can be picked up in the afternoon. We offer same-day service, service while you wait, and rush service - at no extra charge! See what the locals have to say about Alex in this article taken from the South Orange County edition of The Sun Post. Please visit us soon and let our expert staff service your clothing needs.